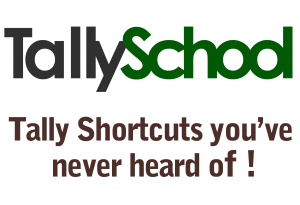 Now that you have confirmed your subscription with TallySchool I will send you daily free lessons on Tally in your Email Inbox. You will receive a lesson a day until all the Basics of Tally are covered. Till then quickly download this free eBook on Unknown Tally Shortcuts which I have created and it has some shortcuts on Tally that very few people know of. With the help of these shortcuts you can run Tally at a lightning speed. Trust me! Here is your FREE eBook as a Bonus from me! Refresh the page if the E-Book doesn’t load properly. It is wonderful to see someone like you from science background having interest in Tally. I recommend you to first learn basic accounting and then come here and learn Tally. Because, Tally is accounting but in a computerized manner. Just start by understanding 11th and 12th grade accounting books. This might seem a bit weird but it is the best way to start. Do you offer basic accounting lesson?? WILL IT PROVIDE ME CERTIFICATION ? I have also replied to your email. I am glad that being a social science student you want to learn Tally. I am a student of BCA but I want to learn Tally. Being a BCA student, I assume you do not have any knowledge regarding accounting. I have done Tally ERP 9 but I want to revised it..
For revising Tally, you can practice. Or just take the free course I’ve created. Iam a full time derivatives trader. I file taxes via CA using ITR IV. i intend to enter all my expenses using tally and also all my contract notes on Tally. can you help guide me to the right steps. You can start learning Tally if you have a basic understanding of accounting. Hi, I am planning to start a coaching centre for new accountant. It will include Tally cull, Msexcel and practical classes. About tally teaching I am expecting your kind advice. Thx in advance. You are doing a great job by educating people. Your subjects like Tally and MS Excel have a good response from industry so it will be good for you too! I’m ready to help you! Please let me know what help you need. Thank you very much Bibek! Thanks for creating such a nice tutorial and videos. I have just started my business and registered my firm into composition scheme. It is not so big yet so I just want to know can I do the accounting by myself in tally? Can you please guide me how can I start? It is nice to see that you are starting a new business. I know that at the beginning you have to do it all! Then you can browse other videos on TallySchool and you will gain a good amount of knowledge. Very amazing story…… Really appreciate your effort. I am currently learning tally 9 and I just need your incredible tips, apart from this I need the book of accounting which will revise me of past three years of graduation. It will be highly pleasure of yours if you will provide me the above material ……….. Thank you Nazir for your appreciation! For my incredible tips you can always visit TallySchool. Honestly I suggest you go through your own material of college for revision of accounts. Hii sir,M intrested In Learnig Tally.M a CPT Appering Student,So sir Can U Help Me. You can start learning Tally by taking tutorials at TallySchool and its YouTube Channel. Am a student from commerce background only.And yeah i know accounting well but the problem is i don’t know how to do those in tally. Main problem is last week i was attended an interview,every thing is fine but they need tally known person i requested them to give me a week time and i will learn. I know now a days interviewers do not rely on degrees or certificates but on the ability and real knowledge. After that go through each and every tutorial on TallySchool thoroughly. And lastly Google for the questions you did not found on TallySchool. Also make sure you learn each and everything in Tally about the company for which you are applying. hey rishi its for my mummy.will it help her to continue her studies ?? You can start with the Free Tally Course on TallySchool! i wish to learn tally ERP 9 can u plz help me. You can start from Free Tally Course Online. I am vinitha ,I have doubt regarding inventory management in tally.could u pls guide me how to do in tally. Regarding inventory, I have made a video on Inventory Vouchers. Currently I do not want to delegate any work to anybody except me. I have got a part time job of accounting head,and I need to get sure with tally applications on account management.can you please help me? You can start with Free Tally Course Online. Or else email me about your specific requirement and I’ll try to help you. It is possible but a difficult task, if I would be honest with you. Why you want to learn Tally if you are an Arts student? No, I do not provide certificate. You don’t require certificates in Tally, if you know Tally. Go to the person who is giving you a job and ask him directly to show everything on Tally and he will agree easily. Hi sir i wanna learn tally but i have just finished my 11 Th and now have to enter 12 !!! what i have to start up with to learn tally?? You can start by Free Tally Course Online here at TallySchool! You can start with Free Tally Course. Dear Rishit, i’m in Franchisee business, kindly suggests how do i start learning ERP Telly on line. In franchise business, all the things are same as other businesses. Start as if you are doing a normal business. It will take some more time and effort for you to learn Tally since you are not from Commerce. Start with Basic Accounting Course and then move on to Free Tally Course. Start with basic accounting and then start learning Tally. Tally is nothing but accounting in digital format. I have created a Free Accounting Course. You can start right now. I would like to answer for karan singh question. Because i cmpltd MA mass communication and journalism. Now i really want to learn tally. So is it will be difficult to catch up who dont have any base on accounting. i have join a co. for accountant I have know tally but knowledge is very low so I want support .by email or social network . You can start learning through Free Tally Course Online. You will receive it everyday! I have a student who is from 12th Arts just like you and he is learning very good. You can start learning Tally with the Free Tally Course Online. i want to know what is tally. You can start with the Free Tally Course Online! You can start from the Free Tally Course Online! Can you please help me in below entry. I need your help in tally to enter inventory with overhead expense. Let suppose we bought from ABC CO.
We paid custom and clearing charges for above inventory. This above custom charges and clearing charges to be paid to DEF CO. The entry is simple purchase entry. It does not matter whether you pay custom and clearing charges to ABC or DEF as long as you are paying in cash. I am graduate in b.com n now I am taking admission in MBA at the same time I want to learn tally. You can start learning for FREE at Free Tally Course Online on TallySchool. You can start with Free Tally Course on TallySchool! Thanks for your blessings, Edmond! You can start with Free Tally Course Online here on TallySchool! Sorry, but I do not provide matter in Hindi. Although you can buy a book on Tally in Hind. I’ve recommended it on TallySchool. It would be awesome, if you share your insights on Tally here on TallySchool. In interviewers are mainly focusing on financial applications only. You can start learning Tally with the help of Free Tally Course Online. Very very helpful to me tally school. Start with the Free Tally Course Online on TallySchool! its done bhaiya.. i have downloaded the tally ebook.. its so interesting to learn tally.. and i am so excited in learning tally at home by myself with ur help.. bcoz as i see my frnds going to classes n spending money n learning ths course.. i fall loving with ths tallyschool.. fingers crossed for the g8 learning i m gonna have here.. thq u so much bhaiya.. Thank you so much for your compliments and good words. I am sure, you would learn the best of Tally here on TallySchool. You can start from Free Tally Course Online on TallySchool. Indeed, I will help you! For payroll, you would have to purchase the Tally DVD Course. I have gone through some of your comments I also need to get some basic understanding of accounting before I start with your TallySchool. Can you please guide any online stuffs to get the basic understanding of accounting? For basic accounting, you need to go through the Basic Accounting Course here on TallySchool. Sir to start this do I have install a tally software? If yes which and how please me I am confused. You have to install Tally software. You can download Tally for free (educational version) here. Ye video whatsapp par nahi mil sakta. i had already learnt tally .but forgot everything. Start from Free Tally Course! It totally depends on you in how many days you can learn Tally. It can be 10 days or it can be 100 days. I am working with Tally but I want to know more about it. And want to understand if a person is both debtor as well as creditor. what would be the ledger made. I will be very much thankful to u.. It is very much possible that a same person can be a debtor and a creditor. You can create the ledger under debtor or creditor. At the end of the accounting period, if the balance is on debit side, make it debtor otherwise make it creditor. Can you suggest me about advance of tally??? For learning advanced Tally, you need to buy the Tally DVD Course. I am here to teach Tally. Read each and everything on TallySchool and you will learn Tally in a great way. can u tell me how can I download pdf files of tally books .. I can tell you about the books on Tally which you can buy. The entry will be something like this. Start from the Free Tally Course on TallySchool. May I know what kind of help do you need? I completed B.E mechanical Engineering and I am very much interested to learn tally.First what are the basics to learn.can you suggest me step by step pls. I’m a theoretical tally learner’s of yous recently, I’m b.com graduate. I want to become an expert in tally erp, the company jobs I’m looking for ask for Tally expect with VAT on hands. For becoming Tally expert in Taxation, you need to buy the DVD. That means you cannot create more than 9,000 companies in Tally. Delete a company and try again. On the other hand, how the hell did you created 9,000 companies? Hey how long does it take to complete the entire course ??? If you know a little bit of accounting, it will only take 6 days to complete the Free Tally Course. I want to learn Tally erp 9 fully with GST (Newest Version). I am creating a course on GST in Tally and it will be available soon. I AM UNABLE TO DOWNLOAD EDUCATIONAL VERSION OF TALLY.ERP9 VERSION 6.0 OR 7.0. PLEASE HELP ME. The link is working and I am able to download the setup file. Learn Tally from TallySchool and ask questions if you have any difficulty. Hi rishit, I loved your videos.. I am currently teaching in a school and I am a commerce graduate, since I have been out of touch I have forgotten the tally, I had done a course on tally 7 years back.. I have to change my sector and for private jobs tally is a must please help me to regain my knowledge considering me as a beginner. I would be happy if you learn Tally from here. You will surely learn accounting through TallySchool and much more than that too. On certain products like Cigarettes, there is an additional tax which the government collects and it is called cess. Go ahead and start the Free Tally Course Online. Thank you so much Satish! You can start with Free Tally Course Online which is the beginner level course for anyone. If you want to understand basic accounting which is necessary to understand Tally, you can also start Basic Accounting Course for anyone. i want to learn tally at its fullest..
i am poor in knowledge of accounting, as i am studying from arts side, want to learn tally for my own business , is it possible ? Accounting is not that tough. Start from the Basic Accounting Course. Then, Free Tally Course Online. And, in between if you have any doubts, go through the comments or comment your doubt. You can start by going through the Free Tally Course Online! can we become expert by your free course? No, you cannot become an expert with just the Free Course. But, let me tell you something more important. You can become an expert even without buying my course. You just need to practice Tally and accounting in real world. What my course will do is guide you and help you when you are stuck. Will I get tally completion certificate after completion of the tally course through your site? You will get the certificate after the completion of Free Course as well as the DVD. You will be already getting emails daily for the Free Tally Course. A is a partner in a XYZ firm. A’s Account in ICICI bank. As per your explanation, I am understanding that A is paying his Credit Card payment from his savings account. Please send us detailed and comprehensive accounting and inventories along with cst and gst package. You will get the emails regardigng GST in Tally. CST is now abolished by the government. I will send you the emails of everything step by step. Hi ! I want to know about tally entery for loss in stock market. As on 31/03/2018 my balance is 92878.00 in share market. how to entery in tally for loss? In accounting, when you sell the shares, then only you have to pass the entry. Even if your balance has reduced, until you sell it, it cannot be accounted in Tally. So, in your case, if you sell the shares, you pass the selling entry and then the loss will be automatically calculated. Hi, I am 68 young and retired from business 4 years back. I have lost touch and do not know anything about GST and also Tally since we had our own customised software. I have just taken up Tally school. I hope I can learn both Tally and GST in times to come. How much time it will take? Thank you so much for taking up TallySchool. It will take a week for the Basic Tally Course to complete in which you will learn many GST and Tally concepts. Sir, I have not received Lesson no.1 & 2. How do I get them? First email is with lesson 1 and 2 which is the welcome email. This course is designed for everyone including BBA students. You will learn Tally easily. 1. We do physical inventory count of each stock items. My question is, can i just alter the quantity of each stock item and put it what we have counted when we do the physical inventory? 2. Will this affect also the Balance Sheet and Profit and Loss ? Yes, you can do the physical inventory as per your count. You have to go to Inventory Vouchers and then select Physical Stock of press ALT+F10. Then enter all the quantities which you have counted. Yes, it will affect the Balance Sheet and Profit and Loss Account as the value of the closing stock will be changed because you changed the quantity. I think the TCS deduction entry will be similar to TDS deduction with the only difference that it is TCS and not TDS. thanx tally school for providing me better knowledge regarding tally erp9. I hope you will always be me providing the knowledge. 1 problem is there in my educational mode tally that in vouchers entry the date is not taken after 2 of any where why? please answer this in my mail . I will always be thankful to you and god will bless you. Thank you Shamshad for your kind words. In educational mode of Tally, you cannot do entries on all dates except some few dates. For doing entry on all dates, you have to buy the full version. Hi, how to make a sale entry having partly cash and partly thru credit card. The sale is made from another software, from that we issue the bill to the customer. After that each sale bill will be entered in tally where we maintain the accounting. Please give the solution. You have to create a new Voucher Type called POS Sales and use the option POS Invoicing. Then, when you create the sales entry, select the POS Sales as Voucher Type and then you will see the options of taking cash, cheque , debit card and so on. Today with the introduction of GST, Tally is used by more and more businesses through out the country and even in some parts of UAE and Africa. It can take a month to a month and a half to be an expert in Tally. I cannot guarantee you anything but you can minimum on an average of ₹15,000 per month in the beginning after you learn Tally. I am there to help you. Please comment or email any doubts you have. Please do let me know anytime you need help regarding Tally, Accounting or GST. Even if you need any other help, please let me know and I will help you out. I am glad, Nida that you are happy to start the Free Tally Course by TallySchool. Please check this post which is specifically about Debit and Credit Notes in Tally. i cant download the pdf of the tally lessons. am seeing a lot of instruction hereand there making the whole thing inaccessible. Please refresh the page and download the ebook. It is uploaded in Google Drive and you should be able to download it easily. Sir i know 30% of tally but i cant recognized that when i create a ledger i don’t know what is the actual related groups for those ledger’s. Please help me to find out the proper way. As I am Accountant by profession and have bunch of company created in tally so I want to export that too. This is indeed a good question but currently there is no option to export all the companies list in Tally. If there will be solution to this, I will definitely let you know. You will get email everyday! By now, you must have received all the emails. I am using Tally ERP 9 for my start up company, as I don’t have complete knowledge of Tally seeking your help for the same. Kindly let me know how to enter cash expense, rent, salary etc in Tally. This is a very basic accounting question that you have asked. You will be receiving emails about the accounting entries and so on. You can also learn from this basic accounting course and that will help you immensely. Whenever you receive the payment, whether it is in advance or otherwise, pass the receipt entry against that debtor or creditor and it will be fine. If you are using the option – maintain balance bill by bill, you can use the option of Advance in the accounting details while passing the entry. I want to set “Prevent Duplicates” to “No”. How to do this? For that you have to create a new purchase voucher type because if you have already created a voucher in tally under purchase voucher, then you won’t be able to set the voucher numbering to set prevent duplication to NO in that voucher type. I have a an issue regarding Optional Vouchers option in Tally. For Proforma Invoice purpose, I have set Optional Vouchers active, but the serial number of these are not being updated whenever a new Invoice is entered. All of them are being generated as Voucher No-1. Please help resolve the issue. You have edit the voucher types for which there is automatic voucher numbering. Go to voucher types from accounts info and alter the voucher type for which you are entereing the voucher. In there, you will find voucher numbering. Set that Automatic (Manual Override). Its impact will be under either sales or purchase because both the GST either CGST or SGST are for sales and purchases. How will I get the certificate of this course, nd is that certification is valid?? You will get the certificate online issued on your email. This certification is valid but we are not affiliated with any government or private entity for issuing the certificate. long provisions comes under which group in tally ? Long Term Provisions will come under Provisions.